This is the second part in the series of The Cancer Diagnosis. Here is Part I. When I first heard about the tumour, I felt lost. Consonant with the feeling of falling between the cracks. First, there was the denial. Never before did I feel so dazed. And when the clouds parted, there was the decision to make. Exactly a year ago this day we, Tejas, my mother & I, sat before Dr. Umesh Kalane looking forlorn, troubled and broken-hearted. 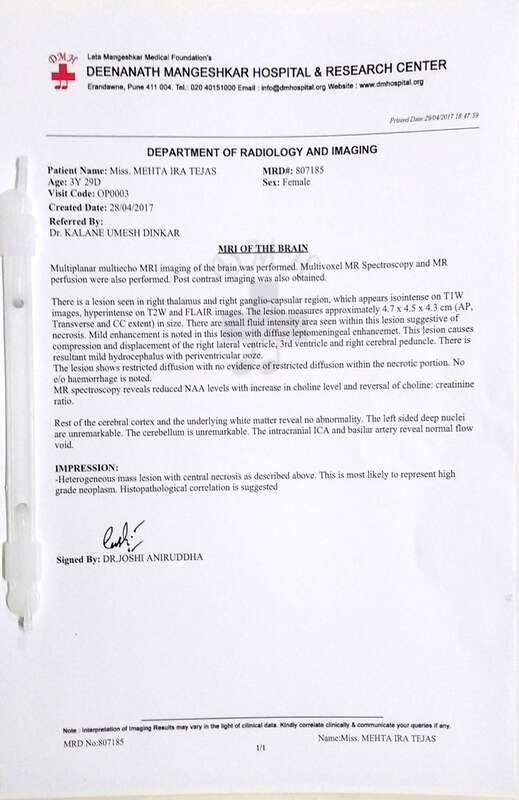 After a plain MRI scan revealed the tumour, the following day Ira had had a contrast MRI done. During a contrast MRI, a dye (gadolinium-based) is administered intravenously to highlight tissues and several other areas of the body parts. REMEMBER A CONTRAST MRI IS NOT RECOMMENDED FOR PREGNANT WOMEN AND KIDNEY-COMPROMISED PATIENTS. TEST FOR SERUM CREATININE LEVELS ARE A MANDATE BEFORE THE PROCEDURE. According to the doctor the way forward was surgery. He had turned his desktop towards us to explain the findings. What we saw on the screen was appalling. The tumour sat right in the centre of her brain. “It’s larger than the eye”, I had commented. In fact it was slightly larger than a table tennis ball. It measured approximately 4.7 x 4.5 x 4.3 cm. A table tennis ball is 40 mm in diameter only! The location of the tumour was the twisted-knife in the wound. Ira’s was a thalamic lesion. The tumour was growing at the thalamus, a small structure within the brain that relays motor and sensory signals to the cerebral cortex. It also functions in regulation of consciousness, sleep and alertness. Imagine a sphere, supposedly the brain with a centre. The thalamus is situated near the centre of the brain, just above the brain stem (the brain steam has the regulation centres of the vital functions including heart and respiration), with nerve fibers projecting out to the cerebral cortex in all directions. The thalamus is that critical! 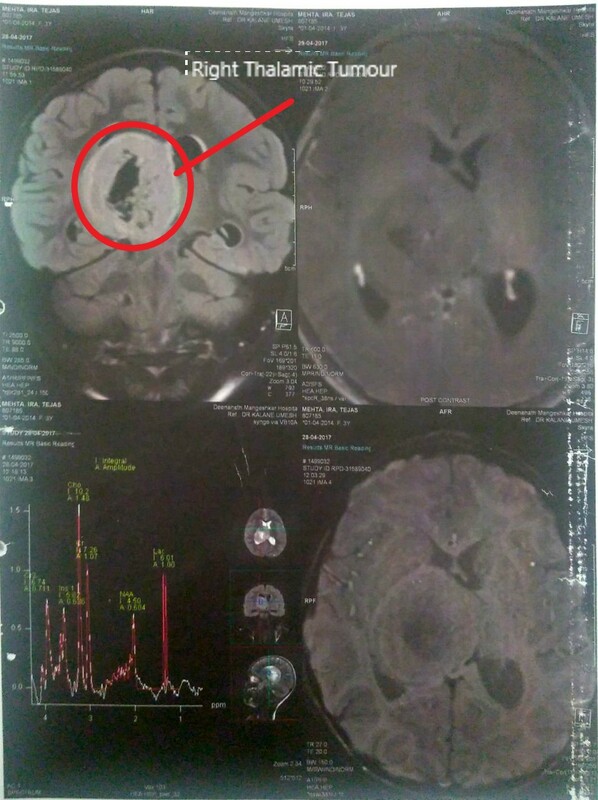 MRI Scan: The red highlight shows the tumour. This kind-of explains the tremulousness in Ira’s left hand. Dr. Kalane suggested that we meet Dr. Nilesh Kuruwale. Dr. Kuruwale is a practicing neurosurgeon at Deenanath Mangeshkar Hospital. We had too many questions on our mind and he answered them patiently for over an hour. Prima facie the tumour appeared malignant with calcification at the centre. The MRI report corroborated the same. There was a slight chance that histopathologically it may be benign as the tumour was attached only at one end to the thalamus, the rest occupied a cavity in the brain thereby suppressing other areas. How much time did we have? Very less. There was a slight build-up of pressure (resultant mild hydrocephalus according to the report) in the brain and any decision should be taken within 4-5 days, a week at the latest. Given Ira’s age a stereotactic biopsy was not possible, hence Dr. Kuruwale’s plan was to do an open biopsy while removing as much of the tumour as possible. This article here explains the different types of brain biopsies. As it was a long weekend with a holiday on 1st May we could only get an appointment with Dr. Apte for the following week. When Dr. Doshi told us that Ira had only 6 months to live probably, I did what I usually do when I face negativity. Honestly I tend to dis-associate from a negative person or feeling and try to ignore it- block it out of my mind completely. So I ignored what he said. Who needed negativity amidst this? Dr. Doshi had told us that it is a malignant tumour. His plan was to do a biopsy to confirm the same and recommended either chemotherapy or radiotherapy depending on histopathological findings. We heard the most positive reviews about Dr. Deopujari. From all across the segment of our relatives and their doctors and friends there was one name that stood out – Dr. Chandrasekhar Deopujari. 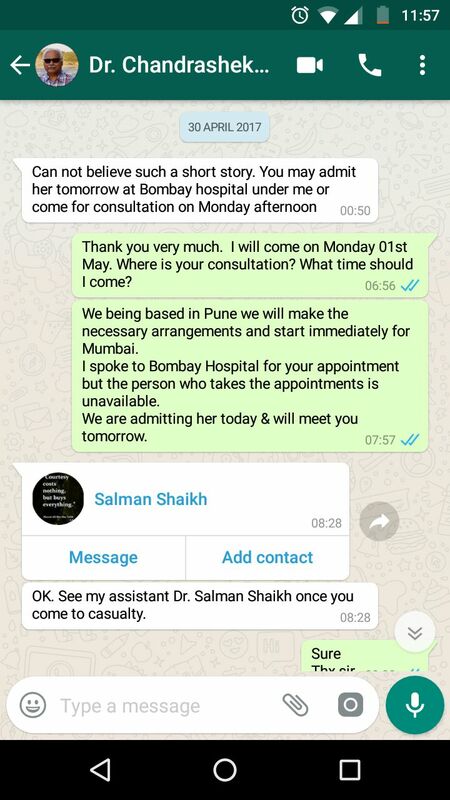 We sent the reports to Dr. Deopujari through Whatsapp. And he did reply. Dr. Deopujari’s response to Ira’s reports. On 30th April we barrelled out of the city in two cars, Ira and her entourage consisting of Ira’s mumma, her dadu, my mom & sister, my mother-in-law, Ranjeet mama, Viraj (cousin) and Samprit (brother-in-law). 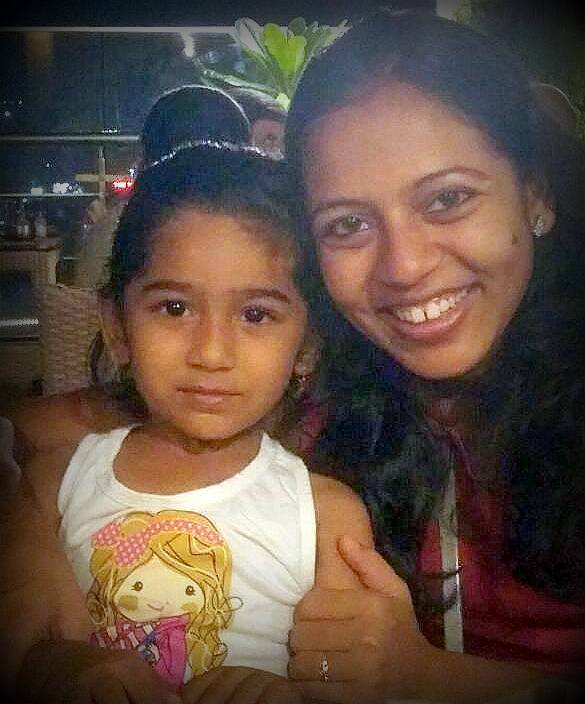 There was an unusual quietness amongst us that day- our hearts fluttering for that little child who slept peacefully all the way to Mumbai. Do you know of any great neurosurgeons & neurologists in Maharashtra or out of the state? Please share with us. I am 4 year old Ira's mum (mumma). This blog is about Ira's journey through cancer and dealing with it together as a family. It is also about building a perspective of life, spreading things worth sharing and of love and hope. "Thank you for the additional information. 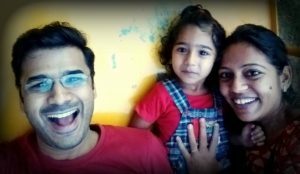 🙂"
"Thank you for sharing your experience with us Gautam. " "Thank you for reaching out sir. It means a lot. Your words..."
"Thank you Shradha. Means so much. Much love to your little..."
What a great courage your family has shown to challenge that stood up.. I admire you all..
None the less I see our helplessness to defeat the Cancer to the extent we want it to be…May the Almighty show us path to tackle such issue. Even a small fever of child disturbs the home. We can imagine how you have faced these hard days. You have faced these hard days very strongly. Once again salute to all of you and your courage. Hi! Glad you found us. I am here to tell you about Ira – of whatever little she knew of life, her battle with cancer and the journey thereafter. Read more about us here.